Oregon at Work details the working lives of Oregon families from 1859 to the present. I interviewed family members descended from Oregon pioneers to gather historic photos and stories of what it was like to live and work in the state 150 years ago. The book details both personal stories and high level descriptions of what types of jobs Oregonians performed, how much they got paid, and what they spent their money on. This project was done for the state of Oregon Employment Department as part of the agency’s commemoration of Oregon’s 150th birthday. All proceeds from the book benefit the graduate publishing program at Portland State University. The author’s receive no remuneration for this work. 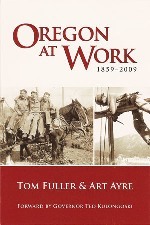 Here is what one reader said about the book: Oregon at Work transports the reader back in time as they learn about what it was like to work in the 1850’s, the 1900’s, the 1950’s and today. The authors skillfully weave personal stories and photographs of 20 pioneer families with historical research and economic statistics to give readers an accurate picture of the life of working Oregonians. Meet the founder of the town of Carlton, a farmer/legislator from 1862, an End of the Trail resort owner, the one room schoolhouse teacher, and the blacksmith. Then jump ahead 50 years and meet their descendants. As the reader moves through time they see a reoccurring theme, Oregonians are strong and resilient people. This book offers readers an opportunity to be encouraged by where we were and hope for where we are going.